DocParser allows to either download document or relates it within SugarCRM's Documents module. Generated WordDoc/PDF can also include the records from a relational module. For example, we have a template for Contact module with information about related Meetings, Tasks or Cases. Now, when you want to have all the information in single Word/PDF, you just need to download a document from RecordView of that particular Contact's profile. The document can be generated from RecordView and ListView. - Yearly For Sugar OnDemand Hosting : This package is for SugarCRM hosted on Sugar OnDemand. This will not support parsing of image on the PDF. Due to the old library of TCPDF. - Yearly For Sugar OnPremise : This package is for SugarCRM hosted on OnPremise. Supports all the feature. Create personalized MS Office or Open Office letters and documents from any Sugar module with one click. 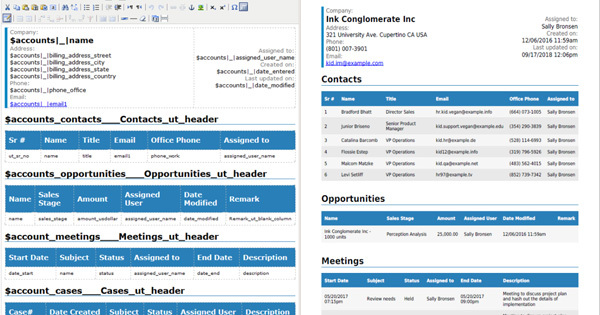 Define and create templates for any module and generate Office documents on any record and its related records. Great for mail merges and more! This powerful template creation engine can be used to create PDFs, Word Docs, or E-mails. 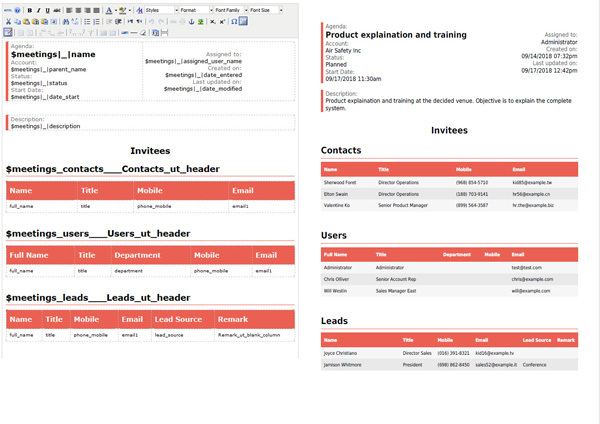 From any SugarCRM stock or custom module create templates and include data from any relationship. Create and embed reusable templates within other templates.